Schuldt’s Resort was one of the many small resorts with under five units that didn’t fit the definition of “resort” used by by the Minnesota Department of Health. It operated on Little Mantrap Lake, near Park Rapids, from the late 1930s into the 1960s. 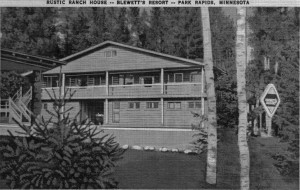 With only one cabin you might wonder why it would be mentioned in The Early Resorts of Minnesota. Henry “Heine” Schuldt was a retired Sioux City policeman who came to Little Mantrap from Sioux City, Iowa. His resort’s name was first found on a 1939 map, but it was likely built in the early 1930s. It matched many of the smallest ones of that era, consisting of a home and one large cabin. Many of his guests were policemen and hunting and fishing friends from Sioux City. Henry was known for his colorful, exaggerated stories. Perhaps that is why I remember him so well. He would vividly tell of his experiences on the police force, and as children, my sister and I would gasp at some of the details we overheard. He had an extensive collection of pistols which he kept in a large glass display case. It was rumored that he retired early because of his frequent gun battles with criminals, who lost. He was an excellent hunter and fisherman and guided his guests in Minnesota and Canada, and he was the unofficial game warden of Little Mantrap. The gable wall of his garage served as a display area for the heads of the largest fish that he caught or speared from his fish house. He added old pairs of eyeglasses to some of the large northern pike heads for humor. Henry’s first wife died of cancer in the mid-1940s. He later married Mina Kitterman, from Sioux City, Iowa. Mina had a daughter named Luella who attended Pine View School in District 86 and later Park Rapids High School. She married Marvin Meyers, whose parents owned Meyer’s Bakery and Delivery in Park Rapids. The couple had four children. Unknown to Mina or Luella, a disabling and terminal disease followed the Kitterman blood line. First it claimed the young Luella, then ultimately all of her children. Luella’s mother, Mina, who divorced Henry, was a cook at Blewett’s Resort in the 1950s. Ironically, she lived to be nearly one hundred years old, outliving her only child and all of her grandchildren. If you have a unique story you’d like to share on this blog, click here to submit it for consideration. This entry was posted in All blog entries, EDGE OF ITASCA stories, Minnesota Resorts. Bookmark the permalink.